In our house we love pizza and fries and chicken tenders and all those other great oven ready meals, and since I don't have asbestos fingertips, I am constantly using an oven glove. 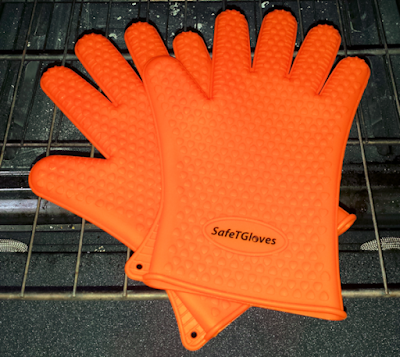 For years we have used those mitten style ones which allow you all the dexterity of a lobster claw, but now I use the SafeTGloves, a pair of bright orange heat resistant oven and grill gloves which allows you to use all 10 fingers independently to handle hot items. I have pretty big hands and they fit pretty well into these one size fits most oven gloves, which are made from silicon and will resist heat up to 425 degrees. Like any guy I had to test that fact to the extreme and what better way than to see how long I could comfortably hold a pizza stone after cooking a pizza at 425 F. I was able to remove the pizza stone and the pizza easily from the oven and managed to hold the stone for a little more than 30 seconds before it started to become uncomfortable. This is more than enough time to put the stone onto the carrying rack and slice up dinner for the family. 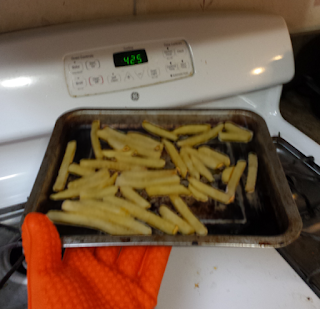 Next test was the steel baking tray full of fries from the same 425 degree oven. This was picked up and held comfortably for more than 1 minute, again ample time to place at the table. These gloves are great for grilling and let you move food around on the grill without having to reach for the tongs. Also they are totally waterproof which means they are also totally greaseproof and will not soak up fat from your food. They do get dirty from charred food when using them on the grill, but that's no problem because they wash up very easily in warm soapy water, or even in the dishwasher. 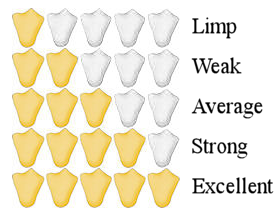 The surface of the glove is bumpy to give extra grip and more confidence when handling heavy or awkward items. We will be making some cupcakes pretty soon, and my daughter will be able to take them out of the oven by herself using these gloves. Overall, I like these gloves a lot. They have taken the place of the dozens of old oven mitts which seem to have a very limited lifespan. These silicon gloves are BPA free and FDA approved and look like they will last a long time in my kitchen. Also they are bright orange so you can take them hunting find them easily when they are not returned to the proper place.